A U.S. high-powered airborne laser weapon shot down a ballistic missile in the first successful test of a futuristic directed energy weapon, the U.S. Missile Defense Agency said on Friday. The agency said in a statement the test took place at Point Mugu's Naval Air Warfare Center-Weapons Division Sea Range off Ventura in central California. "The Missile Defense Agency demonstrated the potential use of directed energy to defend against ballistic missiles when the Airborne Laser Testbed (ALTB) successfully destroyed a boosting ballistic missile" the agency said, Reuters informs. The test, which the Pentagon described as a success, could also help resuscitate an important military program for Southern California, where much of the high-tech system has been developed and tested. "Proving this technology is game-changing," said Loren Thompson, a military analyst for the Lexington Institute, a think tank in Arlington, Va. "The program's funding has been hanging on by a thread. 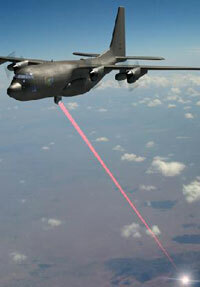 A successful shoot-down of a ballistic missile will demonstrate to Capitol Hill that the airborne laser has potential." In Thursday's test, a chemical laser affixed to the 747's rotating nose turret shot a super-heated, basketball-size beam at a missile traveling 4,000 mph. The aircraft used onboard sensors to track the missile, which was launched from an ocean platform, The Los Angeles Times reports. "The Airborne Laser Testbed team has made history with this experiment," said Greg Hyslop, vice president and general manager of Boeing Missile Defense Systems, in a statement released Friday. Boeing is the prime contractor for the Defense Department project. The U.S. Missile Defense Agency was equally enthusiastic about the results. "The revolutionary use of directed energy is very attractive for missile defense," the agency said in a statement, "with the potential to attack multiple targets at the speed of light, at a range of hundreds of kilometers, and at a low cost per intercept attempt compared to current technologies, CNET News reports.